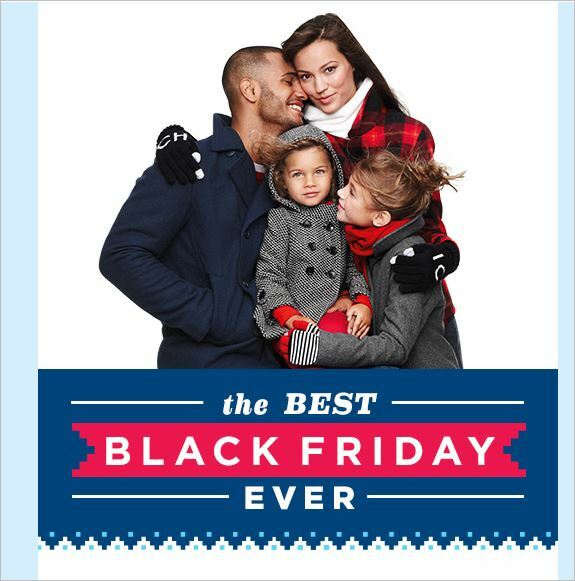 Old Navy coupon code for 30 percent off plus Old Navy Black Friday deals! 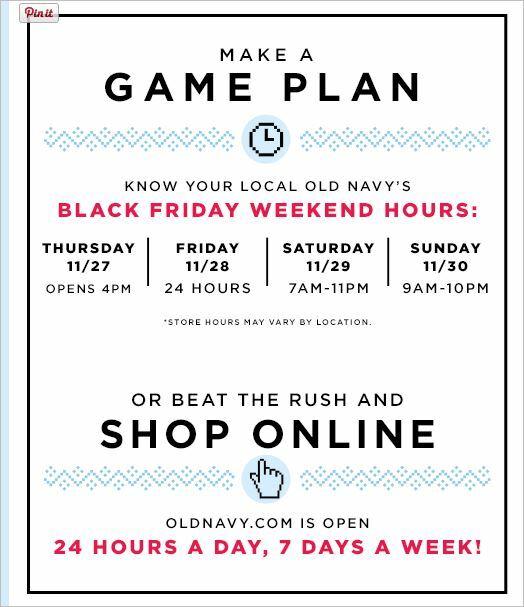 Now through Nov. 26, you can use the Old Navy coupon code EARLYBIRD to save 30 percent off online. The coupon can’t be combined with “five days of deals” offers. Plus, OldNavy.com will offer deals of up to 50 percent off online starting at midnight on Thanksgiving. Old Navy stores will open at 4:00 p.m. on Thanksgiving Day to begin offering storewide savings of up to 50 percent off. Here are some of the Old Navy Black Friday deals you can snag, most of which will be available either online or in-store. T-shirts for the whole family, $5. Sweaters starting at $11.48 (regularly starting at $22.94). 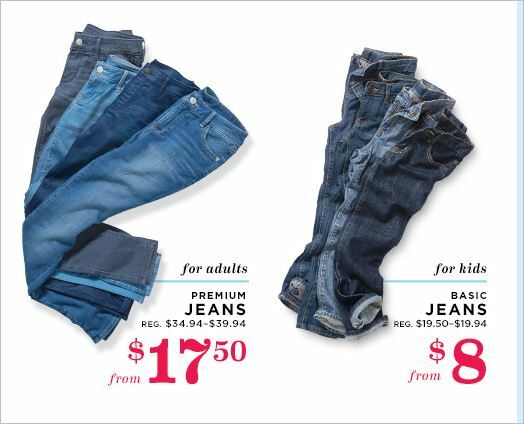 Kids’ jeans starting at $8 (regularly starting at $19.50). Adult jeans from $17.50 (regularly starting at $34.94). Women’s flannel shirts from $14 (regularly starting at $24.94). 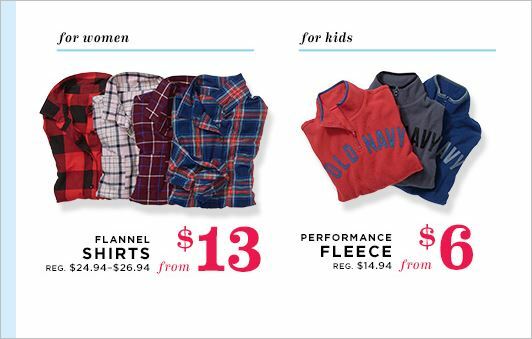 Kids’ performance fleece from $6 (regularly $14.94). Frost Free vests from $14.97 (regularly $29.94 and up). 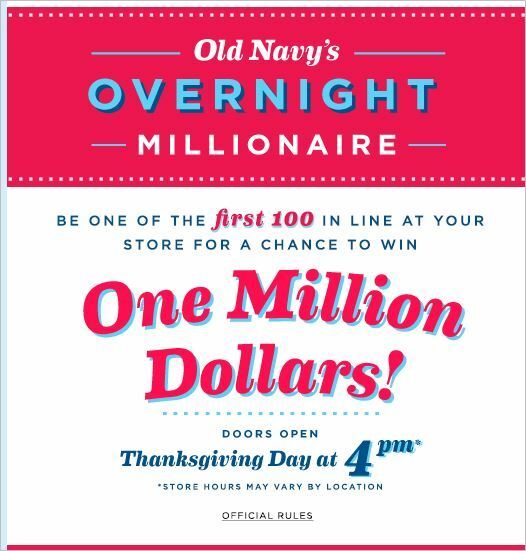 Also, be one of the first 100 people to line up on Thanksgiving at 4:00 p.m. for a chance to win $1 million. Old Navy is part of a family of chain stores which includes Gap, Banana Republic, Piperlime and Athleta. If you’re planning to spend more than $100 at one of these stores in the coming weeks, you may want to swing by CVS first. Through Nov. 26, CVS is offering $25 in Extrabucks Rewards when you purchase $100 in gift cards to Gap, Old Navy or Banana Republic.